The alpha concept has changed over the years. More emphasis is being placed on positive reinforcement as a more effective way to elicit desirable behaviors than stressing pack order as an assessment tool. That said, there is a lot to be learned from this article. Three or more dogs is still a pack. A simple statement and yet a valuable concept when discussing the pack structure of dogs. It defines the way dogs view their lives in relation to other dogs as well as humans in their household. Dogs are pack animals. In the wild, they form social packs, with one dog leading the rest. I’ve heard it said that dogs don’t care where they belong in the structure, as long as they know where they belong. Greyhounds, especially retired racing greyhounds, seem more in-tune to pack dynamics than other breeds of dogs. The vast majority of pet dogs are taken from their mother and siblings at a few weeks of age. These dogs miss out not only on age-appropriate socialization with their siblings but also on the many lessons in dominance and submission that their mother would have taught them. 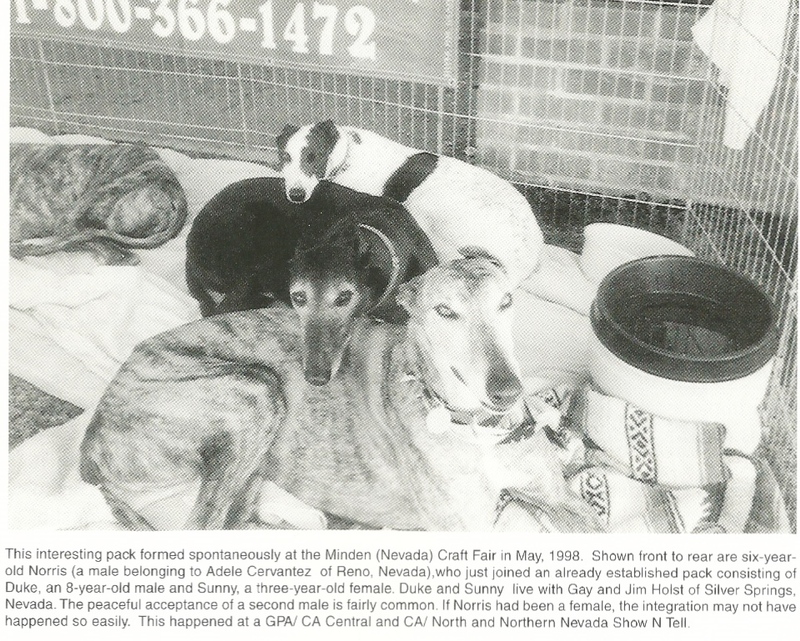 Retired racers, on the other hand, are raised with their mother and siblings and are then moved into larger enclosures where they relate to even more dogs. These greyhounds are savvy to pack structure, which makes it important for owners to understand the basics that drive a pack. This seems straightforward enough, but you might wonder what dominant and submissive dogs are all about. Each dog’s personality will be a variation in intensity of these two extremes: dominant and submissive. Dominant dogs are leaders and display the following behaviors when meeting other dogs: erect ears, raised tail wagging sharply, and a direct gaze. They often have their hackles raised (the fur at the base of the neck), and stand tall with their weight shifted to the rear legs. They growl, leading to sharp barks, and typically lift their legs to mark territory. Dominant dogs aren’t superior; they are simply different, possessing qualities that make them the best leaders and the worst followers. Dominance is nothing more than relative rank. This explains how a dog can act dominant in one situation and submissive in another. In your home, one of your dogs may rank number one. However, when you visit a friend’s house, your top dog may suddenly display submissive behaviors. This means that relative to your house, your dog is alpha (or dominant) but relative to your friends house, your dog may understand it will never be alpha, therefore it does the smart thing and submits. Submissive dogs are followers and display the following behaviors when meeting other dogs: eyes averted, ears flattened against the head and tail down. Taken to an extreme, they will roll over to expose their abdomen and may dribble urine. They defer to dogs above them, often giving up food, toys, or a bed to the more dominant dogs. Submissive dogs seem to appreciate knowing they are beneath the lead dog. Most packs start with a top dog (some folks refer to this as the Alpha dog) and end with a bottom dog (often called the Omega dog). Between these two positions lie any number of other dogs. Typically the alpha dog is the largest and strongest dog, most often male, but in the absence of a strong male, a female can manage this position quite well. In my house, I have two permanent greyhounds, a male (Cody) and a female (Tice). Both dogs display dominant characteristics. When Cody was introduced to our home, it was clear that both dogs wanted top billing. The end result was that Cody was larger and stronger than Tice and was willing to push the envelope of aggression to get the position. Cody became our alpha dog with Tice at the bottom of the pack. Whenever we introduce a foster dog into our home, we disrupt the stable pack structure and the dogs must work out a new pack structure. In the wild, pack rank remains fairly stable. In a household of pets, it can fluctuate wildly. The reasons behind the fluctuations range from bringing in new dogs (such as foster dogs), to a top dog becoming ill or feeble, to a well-meaning owner negatively influencing the hierarchy. Dog packs are not run democratically, and we owners are smart to accept this. Many a dogfight is caused by an owner trying to treat all dogs as equals. This type of situation creates tension in a pack and drives the alpha dog to aggressively maintain his position. You don’t want to ignore the lower dogs in your pack; you simply want to support the top dog in his position. Feed him first, pet him first, and offer him attention first. You’ll find that there is still plenty of time in a day to bond with the other dogs, and you will help keep your pack structure solid. In my own home, I played an integral part in the eventual aggression between Tice and Cody. Tice was my first dog, the queen of the house. Cody was the new dog, a strong male with a big presence. I’m sure Tice would have accepted Cody as alpha dog much sooner had I supported him in this role. Instead, I felt sorry for Tice and did what I could to make her feel special and important. I fed her first, I greeted her first, I gave her treats first. In short, I did everything wrong and was lucky my dogs were able to work their positions out without resorting to extreme aggression. Dogs have an intricate series of competitions that establish ranking amongst themselves. These competitions range from posturing to playing to fighting. Dogs are constantly checking to see if the pack rankings have changed. Watching two dogs posture to determine pack ranking is fascinating. In most cases, the more dominant of the two will stand tall (almost on his toes), ears erect, tail held high in the air and wagging in a quick flagging motion. He’s clearly signaling his intent of being top dog. The other dog will usually stand very still, ears held flat against the head, eyes averted, tail down, clearly signaling that they are willing to hold a lower ranking position. Problems erupt when both dogs display dominant posturing and neither is willing to back down. These events have nothing to do with affection or with cruelty, they are very simple and direct power plays. As you observe dog packs around you and in your own home, you may begin to notice distinct differences in the alpha dogs ruling styles. The two most distinct styles are what I call the benevolent alpha and the pushy alpha. The benevolent alpha is secure in his position and once the other dogs show him the respect he’s due, this type of alpha will allow his subordinates quite a bit of freedom. You rarely hear this type of alpha dog growl; his minions are kept in check by a mere look or body language. The pushy alpha reminds me of the playground bully. He’s busy showing everyone what a tough guy he is and is always growling or dominating the other dogs. When talking about pack dynamics, it’s appropriate to bring up aggression. Unstable packs are ripe for aggression and even stable packs get their fair share. I encourage all dog owners to do some reading on pack dynamics and aggression in dogs. You’ll learn that there are more reasons behind dog fights and pack aggression than a bully alpha dog. If you are experiencing an alpha dog that too freely uses aggression on his other pack members, or have a house with dogfights, you should consider working with a good animal behaviorist. A behaviorist will come to your home and assess your pack. They will recommend ways in which you can improve the stability of your pack or help point out things that you are doing to de-stabilize your pack. There are some new drug therapies that veterinary behaviorists are using to treat aggressive dogs, such as anti-convulsants, Inderal, anti-depressants, and synthetic progesterone. This is an excellent question to ask as humans do figure into the pack structure of pet dogs. Typically, you’ll have two packs working in your home. One pack is the dog-only pack, with its canine alpha through omega. The second will be the dog and human pack, which will (hopefully) have all humans out-ranking all dogs. You can refer to yourself as alpha or simply as the leader, but you need to be clear that you are in charge. Your dogs also need to be clear that you are in charge. You supply the food, you set the rules, you decide when aggression or growling is appropriate (if ever) and you give the commands. You are the leader. If you are unsure of yourself in this role or neglect to train the rest of the humans in leadership qualities, you can be setting yourself up for trouble. Dominant dogs are born leaders, and if they live in a pack without a clear leader, they will step into that role. This can be a dangerous situation for humans and dogs alike. If you own a dominant dog that feels he (or she) is the leader of the house, this is a dog that feels it has the right to reprimand those who don’t lease it. Please understand that not all dogs are waiting to take over your household, but you will run across quite a few dominant dogs that will take the opportunity if you give it. You can do a few benign things to ensure that you or other family members outrank the dogs. 1. Avoiding circumstances that elicit the aggression, at least temporarily. 2. Maintaining an aloof attitude towards the dog (a crate or baby gate will facilitate this). This will make the dog more willing to work with you. 3. Practicing QUICK sits and downs for food two-three times a day for 3-5 minutes maximum. You are working for speed and attitude with this and should reward the correct behavior with generous praise. 4. Restricting the dog’s privileges and working towards adding more privileges (like free time) as the training continues and their behavior is appropriate. 5. Remembering the NILIF Principle.Continue to ask the dog to perform an activity or command for meals or treats or overt attention. NILIF can be used on any type of dominant dog, and the length of time you use the entire program will be based on the level of problems you are experiencing with your specific dog. When giving a command, speak in firm tones. This also applies to reprimanding a dog. No screaming or losing your temper; use a firm, dramatic voice and mean what you say. Encourage belly rubs for your dogs. Take your dogs through basic obedience, not because they need it but because this will help bolster your position as leader and will give you the tools to better communicate with your dogs.